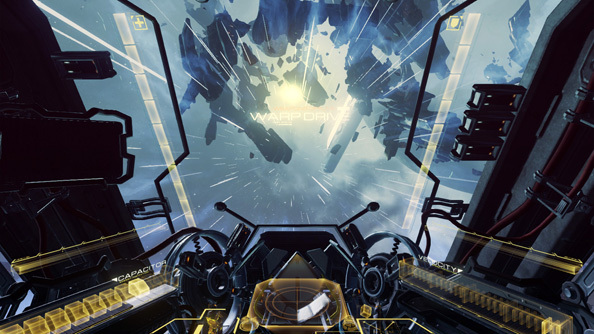 Eve: Valkyrie is now about two kinds of space. 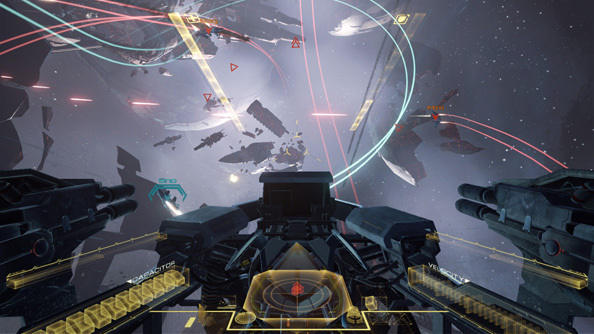 CCP’s VR dogfighter has turned up at Fanfest with heavy ships specialised in area control, a new emphasis on positioning, and clearer map design to help players navigate. The game once known as Eve VR has grown into a confident multiplayer shooter with a structure inspired by but not beholden to the deathmatches we know. Since nailing their initial Unity demo and refining it in Unreal Engine 4 for last year’s Fanfest, the Valkyrie team have cast about for a new game mechanic – something that means victory isn’t just about dealing damage. They’ve settled on control points. Valkyrie’s current demo map is decorated with three of them – floating cans of resources that any fighter ship can capture in the name of their team by deploying a drone nearby. For a while during development captured points contributed directly to wins, and Valkyrie played a lot like Conquest in Battlefield. But that system encouraged more camping than high-velocity space jousting, and wasn’t terrifically fun for it. Now, teams who capture points are rewarded with damage multipliers. A win comes only with the destruction of enemy ships. That jousting’s got better with age too. A tweaked flight model with more consistent physics has put an end to unexpected movement, which felt predictably unpleasant in VR. And boosting no longer takes you straight from zero to breakneck speeds – it’s more gradual, and you bleed velocity a little as you turn, giving you a chance to lock onto enemies as they pass. There are, it transpires, immovable principles attached to Valkyrie. Its core fantasy is to let players feel like space pilots, and any abstract competitive structure that breaks that fiction is a no-no – as the team discovered when they toyed with traditional multiplayer modes like capture the flag. Valkyrie’s new fictional conceit finds two large ships battling over resources. 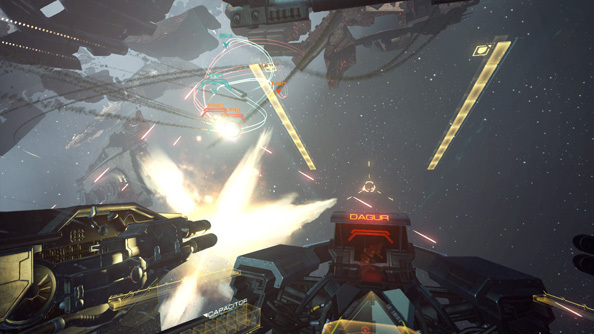 The demo map is named Necropolis – a ship graveyard played around the bones of the same Gallente navy convoy ripped to shreds in this Fanfest’s striking Eve: Valkyrie trailer. Don’t expect a traditional narrative, though. 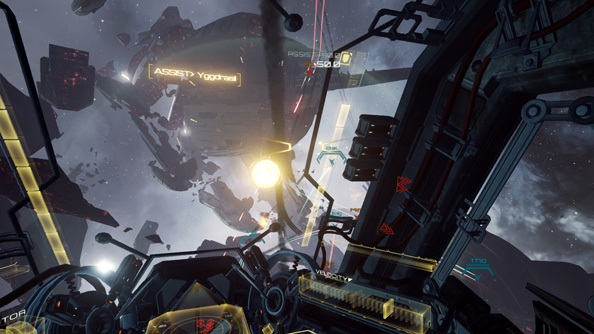 Eve: Valkyrie is designed to be “the best competitive multiplayer game in VR, and that’s it” – despite the ideas for a dedicated solo campaign the team have bandied about over the last couple of years. There will be a handful of story-driven offline training missions, like the one in the Fanfest trailer – probably three of them, and none of them very long. Intriguingly, Siggi would like to expand on CCP’s experiments in storytelling with multiplayer missions at some point in the future – populated by both AI and players. It’s an idea reminiscent of Titanfall, and there’s already a little Titanfall in the way Valkyrie mixes drama into its matches. There’s a great sense of theatre at the game’s opening, for instance. Every time, the player stares down a claustrophobic launch strip; the path ahead of them lights up, and they’re flung out into space by a magnetic catapult. The rush of being slingshotted will lose its novelty, I’m sure, but I’ve an inkling that repetition might increase its charm – just as I grew fond of the smiley-bellied droid on Titanfall’s dropship. CCP have defined a geographical flow to Valkyrie matches that’s new, too. Players can cancel out capture drones by shooting them out the blackness, or by deploying their own – so battle lines are redrawn organically as teammates and opponents alike shift towards contested points. 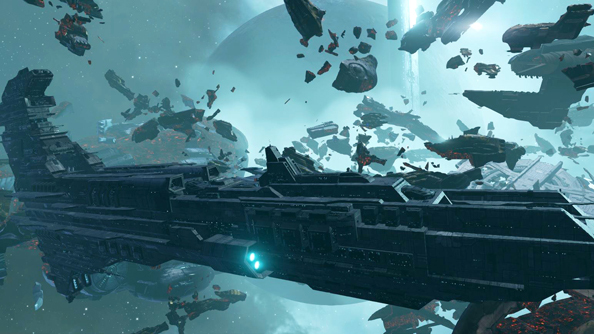 A new heavy ship class, the Spectre, can lock down sections of the map – and loadouts will allow players to customise them for offensive bombing or control point defence. The Spectre is slow, but a warp drive ensures that downtime is kept to a minimum. Though few heavies showed up in my session, Siggi paints a compelling scene from playtesting: five Spectres warping in at once to close off a control point, in a microcosmic recreation of Eve’s classic fleet-warping image. The team are still working out precisely what Valkyrie’s archetypes will be – its healers and snipers and whatnot. But the game will launch with at least three classes – including a support ship we’ve yet to see. A few wrecked vessels act as landmarks for players to steer by. 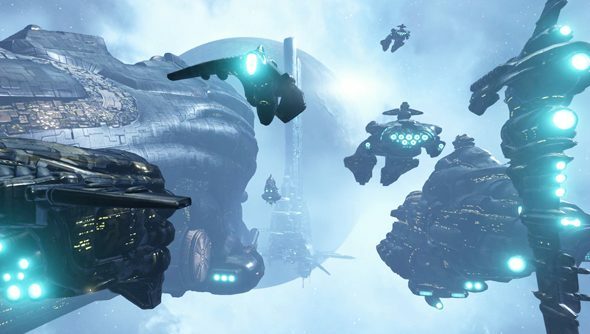 Eve players will recognise the husk of the Erebus immediately – and the rest of us will catch on fast enough to be able to communicate with teammates about where we are. There are no plans for text chat – but Valkyrie will have built-in voice comms and allow for third-party apps.